I had to make two batches of these before I got them right. The recipe said to fill the muffin tin to the top but this resulted in all of the muffins spilling over and running together. 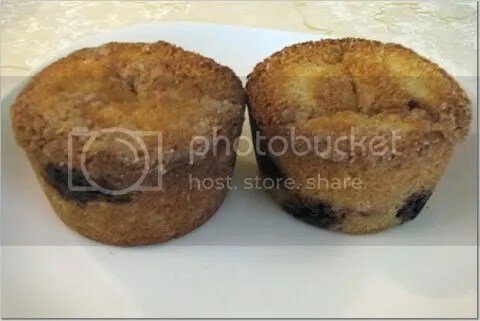 So, I had one big blueberry blob instead of muffins. The second time, I knew better and they came out great. My mom, dad and Scott really loved them. They all loved the flavor that the cinnamon gave them so I am glad I chose this recipe. The recipe makes 8 muffins so they don’t last long! I will be making these again soon. The only minor change I would advise is adding a few more blueberries.